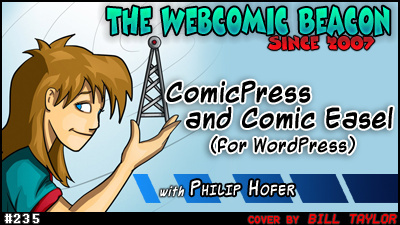 Philip Hofer joins Fes Works, Mark Savary, and Kelly Turnbull this week to talk about his contributions to the webcomics community. That’s right! We’ve got the Frumph! 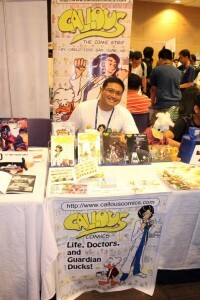 Including his work on the WordPress theme ComicPress, and his NEW WordPress contribution for webcomics: Comic Easel. Break Song: Spam by Devo Spice. Notes: WordPress recommendations for plugins to use with ComicPress or Comic Easel: W3 Total Cache, Search Everything, Feed Statistics, Word Fence Security, Akismet, Jet Pack, Google Analyticator. He recommends that you do NOT use: “All-in-One SEO”. 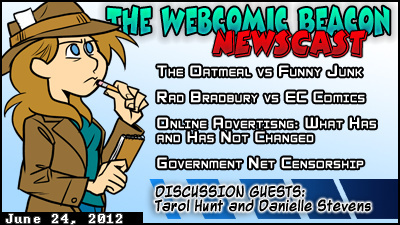 Tarol Hunt and Danielle Stevens (Goblins) join in on this week’s webcomic and comic news discussion! 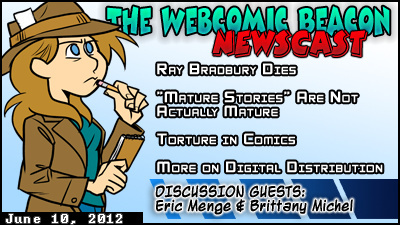 This last week’s comics news is brought to you by Jason Strawsburg, Eric Kimball, and Marie Tary! 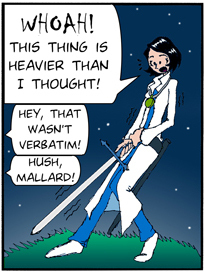 Tarol also calls out and confronts Thom on his opinions on Tarol pulling Goblins from the Top Webcomics List site. The Webcomic Beacon Newscast’s producer would like to remind our listeners that all show participants speak for themselves, only. ReviewZ: The PHD Movie. Based on the Piled Higher & Deeper webcomic. 2011, Inman of the oatmeal posts a page complaining that funnyjunk.com is stealing images from his site. In response Funny Junk admins send out a letter falsely claiming that Inman is trying to shut the site down and telling the users to spam his facebook page. After weathering the storm the outrage is turned back on Funny Junk when it becomes clear that Inman had no intention of pursuing legal action. Funny Junk loses members because of the incident. June 2012 Charles Carreon, the new legal council for Funny Junk, sends a cease and desist letter to Inman demanding that he take down the post complaining about Funny Junk’s business practices and pay Funny Junk $20,000 for lost revenue. Inman posts Carreon’s letter online and says he is going to set up a charity drive on Indigogo for the American Cancer Foundation and World Wildlife Fund instead of paying. At the end of the fund drive he will send a picture of the money raised to Funny Junk along with a drawing of Funny Junk’s mother molesting a bear. The internet explodes in rage at Funny Junk and it’s lawyer. Funny Junk admins immediately take down all contact their information and links from all their sites, delete/ban any poster that talks about the incident on Funnyjunk.com, and make no public statements anywhere of any kind about anything. Carreon, on the other hand, does none of these things. After getting slammed by the rage of the net, Carreon vows he will find some way to take legal action against Inman according to Forbes magazine. He claims Inman is to blame for all the backlash. On June 15 Carreon sues Iman, Indiegogo, the American Cancer Foundation, the World Wildlife Fund, and a currently unnamed individual, who harassed him on twitter, for charity fraud, Cybervandalism, and hacking. This needs to be repeated Carreon sued the American Cancer Foundation and the WWF because they might get some money from people on the internet that he does not like. That is the only reason they are listed on this suit. Paradoxically, not torn to pieces by an angry mob, Carreon has stated he hopes this to be a landmark case in clearing up online fundraising and defamation. He also says this is not because he’ trying to punish Inman. June 22nd The Electronic Frontier Foundation has stated that they are joining Inman in the fight against Carreon. 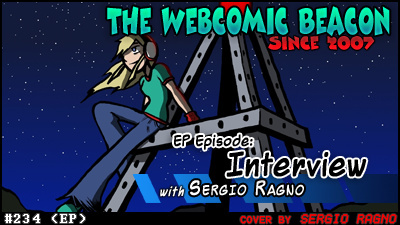 Sergio Ragno joins Fes Works and Mark Savary for a short episode this week. We are here to talk about Serge’s webcomic Thirteenth Child; as well as touching on another webcomic he is working with Lewis Lovhaug, The Lightbringer. 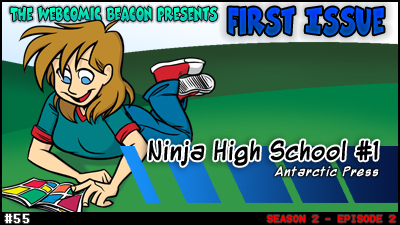 We even talk about he beginnings on ComicGenesis and his occasional adventure series: The Adventures of Action Hat. Q6: How did you first get into making Comics? A6: I used to spend the long, lonely summer days by drawing comics in empty notebooks. I used to read a lot of Archie books and newspaper funnies and those taught me the basic fundamentals of comic-drawing and story flow. Then one day, on a whim, I applied to be an artist for my high school newspaper and drew comic strips there. That was my first taste of having my work published. 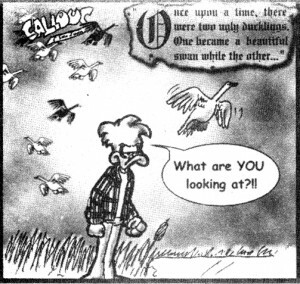 I also joined my University’s student paper and started Callous comics in 1996. I brought the series with me to my medical school newspaper and continued Callous there, albeit revamped. 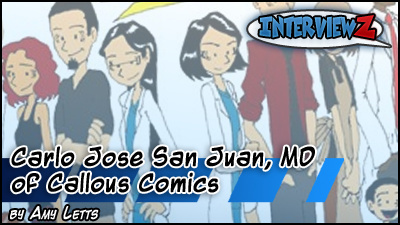 Q7: How do you juggle being a Doctor and a Cartoonist? Q7: It’s all about time management. I collectively put in around 2-4 hours a day working on the comic. But those hours are squeezed into my daily life as a physician, father, and husband at various times of the day. Pretty much a “do whatever I can whenever I can” state as I wouldn’t know ahead of time when I’d be able to work on the comic. So it was important for me to streamline my process as well as to keep my comic production necessities mobile. For example, I have a blue pencil, a small eraser, a small ruler, and an inking pen as drawing materials and that’s it. Having only one pen “forces” me to adhere to “ligne claire” linework, which I self-studied to use effectively. I have ready-made three or four-panel and Sunday strip templates in an MS Word file so whenever I’m free I just print out those panels onto a letter-sized paper and pencil away and ink on top of the initial sketches. While I do have a portable scanner and laptop ready (for slow days at work) I usually scan, color (mainly flat fills, no time for shading), and letter in my home desktop after dinner when the kids are asleep. I then upload the finished strip to the website and do a bit of marketing (like scheduling tweets). Q8: What are your main inspirations? A8: Artistically, I have several. Jim Davis (Garfield), Charles Schultz (Peanuts), Sergio Aragones (Groo), Hergé (The Adventures of Tintin), Sōbē Amako (Rakudai Ninja Rantarō), Hiroaki Samura (Blade of the Immortal), and Dan DeCarlo (Archie) probably make up the backbone influences of my comic strip art’s basic appearance and dynamics. As for the writing, I look up to Walt Kelly (Pogo), Charles Schultz, and Bill Watterson’s (Calvin and Hobbes) work, particularly how they deliver their humor and in a sense how they “dance” the basic four or three panel rhythm. When I seriously entered the world of webcomics and eventually moved the series on to color, I looked at Hergé’s use of color to coincide with his straightforward linework as an initial starting point to work from. From there I’ve been teaching myself coloring, philosophically inspired from a comment by Eddie Pittman (Red’s Planet) on his own work, attributing it to experimentation and luck! Q9: What’s the most interesting thing ever to happen to you at a comics convention? A9: Wow, that’s a tough one as so many interesting things have happened to me at comic conventions in the last few years. My short yet memorable chat with the late Tony DeZuniga (Jonah Hex) definitely ranks high up there. 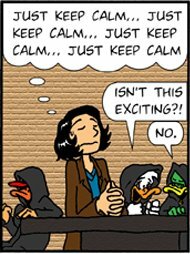 I also remember a lengthy discussion about cartoon ducks with a con attendee which was wildly stimulating. But perhaps the most interesting and most surreal is when Gerry Alanguilan (Elmer) passed by my table and I asked him to sign a comic I contributed to that he drew the cover for. While he was doing so, suddenly, David Lloyd (V for Vendetta) came by to chat with him and there I was standing next to these two heroes of mine absolutely stunned and speechless and trying my best not to show it. So starstruck and caught off-guard I was that they were right in front of me and I had no clue as to what they were talking about. Eventually they walked away with a mild degree of urgency, still chatting, and I sat back down at my table, probably forgotten but I didn’t care. I smiled to myself the way one smiles just enough that the personal knowledge of the smile is there but no one else would notice it. Finally, an attendee came by inquiring about my comic and it was back to business as usual. On another semi-related note, my wife lined-up to have a copy of the V for Vendetta trade paperback signed and sketched on by David Lloyd as a surprise for me. 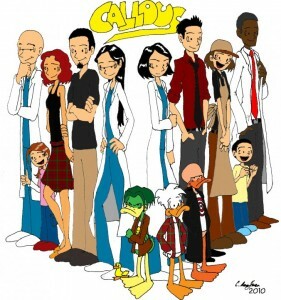 However, instead of the iconic Guy Fawkes mask everyone else seemed to ask him to draw, she asked him to draw a duck. And he did. Q10: Okay this is the last question and it isn’t really a question. This is open mic – Your chance to say anything else you want to say about ‘Callous Comics’. A10: I actually wish I put more thought into the series title. Just before the second strip was going to print, my editor wanted me to think of a permanent title for the comic. After hours of thought I grabbed a dictionary, dropped it on a table on its spine and as it opened up the first word I saw was “Callous”. I thought it was cool and edgy, which was what I was going for at the time, so I went with it. I also didn’t really think the title was all that important either. Midway through the college paper run I began to grow tired of writing caustic humour and realized I wanted to write something more “me”. I gradually shifted the comic’s flavour to an all-ages one. However, “Callous” had already developed a small following so I kept the name. I now think of the title as a reference to the medical condition as opposed to an adjective so that it somewhat applies. Nowadays, especially in comic conventions, I understand the power of a well thought-out name. I envy titles like “Zombies in Manila” which tells you pretty much everything you need to know at first glance. Whereas with “Callous” I’d have to give a lengthy explanation of the series to every potential new reader. Nevertheless, I’ve gotten wonderful feedback from regular readers who now have a fond association of the word to the characters of my comic and over the years it has grown its own special place in my heart. 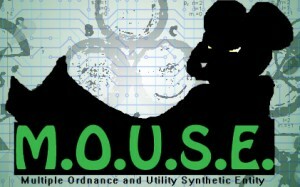 Thank you for the interview Carlos and good luck with Callous Comics and M.O.U.S.E. Or do you have a webcomic? Interested in being interviewed? Get in touch! 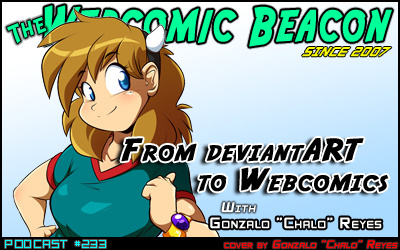 Gonzalo “Chalo” Reyes joins Fes Works, Mark Savary, and Kelly Turnbull this week to talk about his webcomic, Las Lindas; and his journey from deviantART to webcomics. We also talk about the comics group The Kat Box, of which Las Lindas started and is a part of. Break Song: Cowgirl in the Sky by Terry J. Copley. 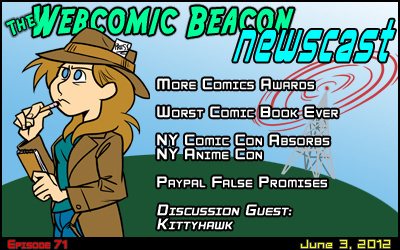 Kittyhawk (SGVY) joins in on this week’s webcomic and comic news discussion! This last week’s comics news is brought to you by Thomas Revor, Eric Kimball, and Alex Heberling. WSJ on Comics: Worst Comic Book Ever!